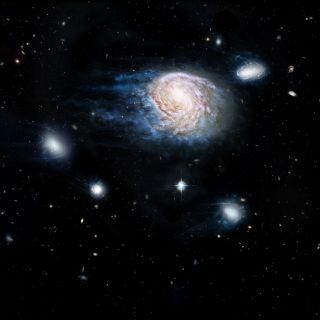 An artist's impression of ram-pressure stripping of galaxy NGC 4921. Stripping removes gas, the raw fuel for star formation. What's causing so many galaxies in the universe to die before their time? A new study sheds some light on this galactic murder mystery. A galaxy is said to "die" when it stops forming new stars. These form from thick clouds of gas that become extremely cold, causing the clouds to condense and collapse into solid, compact objects. Most attempts to explain galactic death focus how that cold gas is lost or used up inside a galaxy. Over the course of a typical human lifetime, most galaxies appear to sit still. But these immense collections of stars, gas, dust and other objects are actually moving through space. Galaxies move when they are pulled on by the gravity of other, nearby galaxies or by dark matter, the mysterious material that is five times more common in the universe than "regular" matter. Most galaxies (including Earth's own Milky Way) are thought to have a halo of dark matter surrounding them; these dark matter halos can pull rather dramatically on smaller galaxies that live outside galaxy clusters, the researchers said. "During their lifetimes, galaxies can inhabit halos of different sizes, ranging from masses typical of [the halo around the Milky Way galaxy] to halos thousands of times more massive," Toby Brown, leader of the study and a Ph.D. candidate at the International Centre for Radio Astronomy Research (ICRAR) and Swinburne University of Technology in Australia, said in a statement from ICRAR. As a galaxy gets dragged around through space, it may pass through clouds of intergalactic plasma (an electrically charged gas). The plasma acts like an atmosphere and creates drag on the gas inside the galaxy, sweeping it out into space in a process called ram-pressure stripping, Brown said. "You can think of it like a giant cosmic broom that comes through and physically sweeps the gas from the galaxies," Brown said. Ram-pressure stripping is known to affect galaxies that live in large galaxy clusters (containing more than 100 galaxies), where large amounts of dark matter also influence the motion of individual galaxies, the statement said. "This paper demonstrates that the same process is operating in much smaller groups of just a few galaxies, together with much less dark matter," Brown said in the statement. The study examines 10,567 satellite galaxies, or those that exist outside large galaxy clusters; Brown said in the statement that "Most galaxies in the universe live in these groups of between two and a hundred galaxies." The authors were able to study such a large population by using a technique called stacking, which makes it possible to learn about a population of objects that are very faint by combining the data from all of the objects and determining the average characteristics of the population. "We've found [that] this removal of gas by stripping is potentially the dominant way galaxies are quenched by their [surroundings], meaning their gas is removed and star formation shuts down," Brown said. There are multiple hypotheses about how star formation can be halted in galaxies. Many dead galaxies are thought to have used up all their cool, star-forming gas in a process called strangulation. Galaxies that have been strangled tend to have high levels of "heavy" elements that are formed in stars. Galaxies that had their gas rapidly removed may contain lower levels of heavy elements, because the gas is removed before stars can form, past studies have found. The study was published online in the Monthly Notices of the Royal Astronomical Society on Nov. 23, 2016.